These days, when it comes to bedroom furniture, antique is chic! Antique Mission bedroom furniture takes you back to a simpler time when quality craftsmanship and attention to detail really mattered. The collection of solid wood Antique Mission bedroom furniture available from AmishOutletStore.com provides a traditional yet elegant look that you’ll enjoy for many years to come. 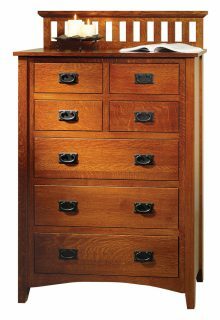 Our Antique Mission furniture is constructed one piece at a time by highly skilled Amish craftsman, the same way it was made more than a century ago – not mass-produced in a factory. Homeowners who have style preferences want to ensure their bedroom pieces are coordinated beautifully. The Mission Antique bedroom collection offers this kind of complementary opportunity due to its streamlined, solid design. Not only does it go well with numerous styles and interiors, but it always looks pristine and elegant. 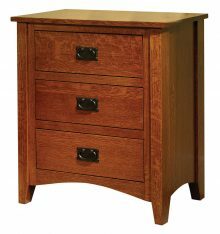 Because the Mission Amish bedroom collection does not include a bed, you have the freedom to choose from other quality AmishOutletStore.com bedroom furniture types to mix and match the right furnishings for your needs. A room that has been customized with several pieces of Amish furniture can look incredible. Just bring your decorating passion! Bedrooms are functional spaces in any home, apartment, bungalow or cottage. However, they do not have to be dull. The Mission Antique bedroom collection adds unparalleled beauty and strength, as well as reliable function. Amish craftsmen spend time making each piece of Mission Antique furniture by hand. This time-honored practice produces items that are as visually appealing as they are practical. Learn why Mission Antique bedroom collection pieces from AmishOutletStore.com are so sought-after by homeowners who want something unique for their living spaces. Order today, and save up to 33% off retail prices. Master bedroom – The master bedroom is typically the largest of the bedrooms. This gives you room to have several pieces of Amish bedroom collection furnishings. Feel free to coordinate from any of our bedroom or other room furnishings for the look you desire. Child’s bedroom – Why throw money away on flimsy, inadequate children’s bedroom furniture that is not made to last? Our Mission antique bedroom collection pieces can be used by kids throughout their lives. Tiny bedroom – A cozy bedroom does not have to seem cramped or crowded. Streamline the flow with an Amish furniture collection bed and Mission Antique nightstand and dresser. Make the most of limited spaces the beautiful way with our fine products. Guest bedroom – Have a room in your home devoted to guests who spend the night? Dress it up in style with the Mission Antique bedroom collection. Your guests will appreciate being able to sleep in such well-appointed quarters. Occasional bedroom – Is there a room in your house that does multiple duties, such as being an office or playroom most of the time, and an occasional bedroom space when needed? This is the perfect location for Mission Antique bedroom furniture from AmishOutletStore.com. Our furnishings give you the ability to effortlessly transform the space when you need it, while still being practical places to store your belongings when the room is not a sleeping location. 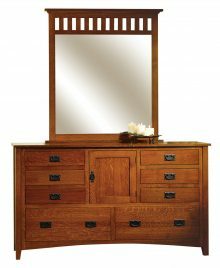 Remember that your Mission Amish bedroom furniture is meant for you and your family to love and use for a lifetime. Enjoy sprucing up every corner of your home and bringing new excitement to your décor with traditional furniture craftsmanship courtesy of AmishOutletStore.com. 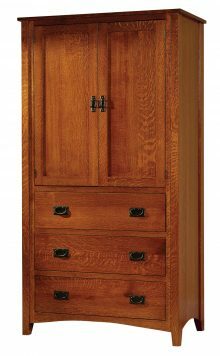 Only the finest cherry, oak and QS white oak is used to make our Antique Mission armoires, nightstands, beds, chests of drawers and dressers. And with a wide selection of oak stains that includes Seely, Michaels, Acres and many more, you can easily achieve the ideal look for your bedroom, whether youre purchasing one piece or an entire set. Use the convenient designing tool to experiment with different solid wood types and stain colors, and let your inner decorator run wild! We encourage you to further explore each piece of beautiful Antique Mission furniture. While youre doing so, be sure to envision how great it will look in your bedroom! Order your new Antique Mission bedroom furniture today right here online or by giving us a call at 1-800-217-6999.